Radical Doubt investigates ethical play across a spectrum of performances, on and off the stage. In witty, recursive, personal, and propulsive prose, Mady Schutzman elaborates on the Joker System, conceived by Augusto Boal, best known for Theatre of the Oppressed. The Joker System is a collaborative approach to representing social dilemmas through a rare fusion of destabilizing ambiguity and journalistic rigor. Schutzman models the Joker System while expanding well beyond the theatrical. In polyphonic compositions that perform their own philosophy, she uncovers illuminating links between calculus and conjuring, kōans and resistance, humor and witnessing, complexity theory and sorely needed new practices of living in our divisive times.□ These life practices rely upon crafty and circuitous strategies to deliver their subversive punch. Jok(er)ing matters, Schutzman insists. When communities fragment and identities fixate, enter the trickster! "These chapters are populated with jokers, clowns, schlemiels, fools, tricksters and comediennes, all of whom test the boundaries of meaning and find novel ways of telling the truth. Schutzman’s deep expertise in Augusto Boal’s Joker System opens a major chapter of political theater history to our contested present, offering readers methods for imagining a different future, and that’s no joke." "I had the good fortune to see Schutzman’s play UPSET! back in 2006, ?and I can testify to the innovative, radical nature of seeing the Joker System in action. A lifetime’s worth of experiment and study with the capacity to unsettle our thinking has produced a warm, eclectic, and totally original work." "A fine example of Boal's legacy in action--with wit and wisdom Schutzman captures the potential of a 'system' that not only resists convention but offers a transformative and at times subversive theoretical framework and performance practice." "Reading this book feels like an affirmation of my own work, and that of many of the people I work with. It is also a guide and a challenge. It is a joy to have someone writing about this kind of work as she [Schutzman] does." Chapter 1 What a riot! 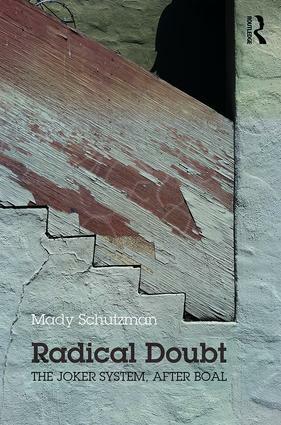 Chapter 6 The joker never dies: the world "as if"
Mady Schutzman is a writer, scholar, theatre artist, and filmmaker. She is author of The Real Thing: Performance, Hysteria, and Advertising and co-editor, with Jan Cohen-Cruz, of two anthologies on the work of Augusto Boal. Schutzman is Faculty Emerita at California Institute of the Arts.